We’d love your help. Let us know what’s wrong with this preview of By the Grace of Todd by Louise Galveston. Ingredient A: A worn athletic soc Perfect for fans of Andrew Clements, Dan Gutman, and The Borrowers, By the Grace of Todd is the laugh-out-loud answer to what happens if you leave dirty laundry on the floor . . . and don’t follow your mother’s instructions to clean your room. To ask other readers questions about By the Grace of Todd, please sign up. I received an advanced reading copy of "By the Grace of Todd" from a friend. Although I feel like I read for a living (I'm a children's librarian), it took a few weeks to start reading this book due to another pile sitting on my bedside table. I wanted to give this book the time I felt it deserved for me to savor it. I savored up to the booger rating scene, then realized this was a book to be devoured with gusto, like Dr. Pepper & Doritos! Todd is an unassuming young man, best friends with Du I received an advanced reading copy of "By the Grace of Todd" from a friend. Although I feel like I read for a living (I'm a children's librarian), it took a few weeks to start reading this book due to another pile sitting on my bedside table. I wanted to give this book the time I felt it deserved for me to savor it. I savored up to the booger rating scene, then realized this was a book to be devoured with gusto, like Dr. Pepper & Doritos! Todd is an unassuming young man, best friends with Duddy, fan of Dragon Sensei with a demonic (in his eyes) baby sister, Daisy, and a geeky neighbor, Lucy, who lives across the street. There doesn't seem to be anything special about Todd until, with a spark, a colony of ant size humanoids, the Toddlians, spawns from his gross, disgusting, filthy dirty baseball sock and he becomes a god! Todd doesn't see himself as a supreme being since he spends a lot of his time dodging bullies at school. Then the unexpected happens...one of the bullies chooses him as a partner for the science fair. What does that mean? Is he finally on his way to being cool? Unfortunately, the bully, Max Loving, discovers the Toddlians and decides that the science fair is in the bag. Will the Toddlians survive? Todd struggles with a variety of issues. Is he responsible for the Toddlians? What makes someone a real friend? How clean should your room really be? It's hard to get your priorities straight when you are only twelve. This was a great read and I see it appealing to boys and girls, alike. The characters are well drawn and likable. The three main Toddlians are unique and funny. And there may be more to Daisy than meets the eye... The suspense builds nicely and the ending is satisfying but assures us that there is much more to come. Galveston's book is spot on in her portrayal of middle grade kids (and their siblings) and her book is laugh-out-loud funny! I can't wait for it to be released so I can recommend it to all of my young patrons. Tried to read it several times and just couldn't get into it. This was a fun read with a very imaginative, but totally relatable premise that I think many young readers will love. 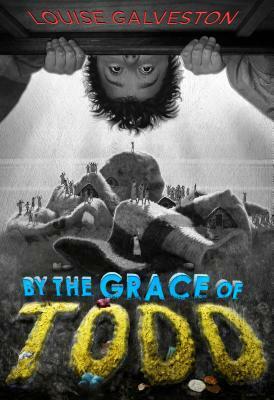 As an adult reader, I especially enjoyed the tiny Toddlians' worshipful attitude toward their "Great Todd," including the faux-Biblical voice of the prologue and some of the Todd-inspired art that comes later in the book--very funny. Some of the gross-out humor, on the other hand, went a little too far for my taste, but will probably play a lot better with its target audience. The This was a fun read with a very imaginative, but totally relatable premise that I think many young readers will love. There's a great cast of full-sized characters in this book, too--my favorite being Lucy, who perfectly walks the line between annoying and helpful. Todd discovers a new species of intelligent life growing on his dirty sock. Unfortunately, the class bully chooses Todd to be a partner for their science project and discovers the Toddlians by accident. When the bully decides this should be their science project, all manner of complications arise. This was an enjoyable, humorous read while dealing with a timely topic of bullies. What a cute book! I love the premise about tiny people being spawned on a gym sock! On the surface, this is your typical story of a middle-school kid trying to avoid bullies, wishing he could be one of the "cool kids", and ultimately learning about friendship and how to stand up for himself. But the addition of those tiny people makes it so unique and fun, especially once the little Toddlians start watching TV and reading the encyclopedia! Their out-of-place references to pop culture, John Wayn What a cute book! I love the premise about tiny people being spawned on a gym sock! On the surface, this is your typical story of a middle-school kid trying to avoid bullies, wishing he could be one of the "cool kids", and ultimately learning about friendship and how to stand up for himself. But the addition of those tiny people makes it so unique and fun, especially once the little Toddlians start watching TV and reading the encyclopedia! Their out-of-place references to pop culture, John Wayne movies, Shakespeare, and Winston Churchill had me laughing in every chapter! It's the details that make this story special! I like the neighbor girl, Lucy, who is home-schooled for "hippie reasons". I loved her intelligent and moral speeches. She's a strong supporting character. I was disappointed in Todd through nearly the entire book. He's such a wimp, but at least he knows he's a wimp and feels decently guilty about it. I thought his moral dilemma and search for courage took far too long. He should have stood up to those bullies much sooner! But once he finally got his heart in the right place, instead of being a selfish idiot, I liked him again. The writing moves a bit slowly at first but picks up towards the middle and end. There are good descriptors and funny dialogue. I loved the little chapters from the perspectives of the tiny Toddlians. Seeing the world through their tiny eyes was a cute way to bring more interest to the story. This book is full of gross boogers and farts and toe jam, so I know that boys will love it. And I know just the boys I'm going to give this book to! Todd's room has got to be the grossest ever. There are dirty clothes and dishes everywhere, he has food stashed under his bed, and I am not sure he has ever cleaned. All this filth leads to new life however when Todd discovers his gross gym sock has created a race of tiny people. The Toddlians worship Todd as their supreme creator. Todd has no idea what to do with them so he enlists the help of is homeschooled neighbor Lucy. Unfortunately, Todd is also bullied and has to let bully Max Loving use Todd's room has got to be the grossest ever. There are dirty clothes and dishes everywhere, he has food stashed under his bed, and I am not sure he has ever cleaned. All this filth leads to new life however when Todd discovers his gross gym sock has created a race of tiny people. The Toddlians worship Todd as their supreme creator. Todd has no idea what to do with them so he enlists the help of is homeschooled neighbor Lucy. Unfortunately, Todd is also bullied and has to let bully Max Loving use the Toddlians for their science project to survive middle school. Max, being the bully he is, also bullies the Toddlians. Todd has to come to terms with his responsibility towards the Toddlians and save them from the evil clutches of Max. Todd's room is such a mess that when he sees a spark flying from a dirty sock, he is concerned that spontaneous combustion might be occurring, so he consults his homeschooled neighbor, Lucy. The two discover that the dirt in Todd's room has given rise to a race of tiny beings the size of ants, who live off of Todd's skin flakes and other detritus. In order to keep the evil Duddy and the even more evil Max from bullying him, Todd agrees to let Max have the Toddlians for a science fair project, an Todd's room is such a mess that when he sees a spark flying from a dirty sock, he is concerned that spontaneous combustion might be occurring, so he consults his homeschooled neighbor, Lucy. The two discover that the dirt in Todd's room has given rise to a race of tiny beings the size of ants, who live off of Todd's skin flakes and other detritus. In order to keep the evil Duddy and the even more evil Max from bullying him, Todd agrees to let Max have the Toddlians for a science fair project, and joins Max's Zoo Crew in order to keep an eye on them. Being in Max's possession is difficult for the Toddlians, who would rather be back home. Todd and Lucy need to work together to keep both the Toddlians and themselves out of Max and Duddy's clutches. Strengths: This had some good moments-- Todd's dad is a nurse and his mother is an out of work music teacher, Lucy lives in her own strange world but helps Todd out when he needs it, and the Toddlians are a fun race, somewhat like The Borrowers. I received this book as a Good Reads Giveaway. I asked for this book because it was compared to The Borrowers. I don't think it lives up to that level but I did find it amusing. It is a good read for it's age group and the story should keep young readers engrossed in the outcome of the Toddlians. The predictable story of wanting to be part of the perceived cool group is at the root of the story but done in a way that should not turn off the young reader. The story moves along at a rate to encour I received this book as a Good Reads Giveaway. I asked for this book because it was compared to The Borrowers. I don't think it lives up to that level but I did find it amusing. It is a good read for it's age group and the story should keep young readers engrossed in the outcome of the Toddlians. The predictable story of wanting to be part of the perceived cool group is at the root of the story but done in a way that should not turn off the young reader. The story moves along at a rate to encourage the reader to keep turning the pages to find out what will happen next. It did make me laugh out loud more than once. Todd is a twelve-year-old slob whose slovenly habits have somehow birthed life on one of his grungy socks. Todd can't even keep a goldfish alive. How will he manage an entire community of Toddlians? Galveston uses a variety of perspectives to tell the story of new life growing from the filth of Todd's gym sock. Boys 9 and up will love the disgusting details and girls will want to be like Lucy, Todd's super smart, scientific- minded neighbor. The author's message about friendship and bullies will also resonate with students today. This book is funny, GROSS, and has a good message. Who knew? The whole idea of a civilization spawning on a kid's nasty sock is the best! I think I should go and check the socks laying on my kids' bedroom floors! I know this would be a great book for reluctant readers. It would also be an excellent read aloud, if you could do the voices and accents!!! VERY CLEVER!!! This book has one of the best premises that I've come across! Todd peeks under his bed only to discover an entire civilization has grown from his disgusting sweat socks and other clutter under there! Louise's writing is lively and fun, and the suspense around what happens to the Toddlians keeps the pages turning! A fun read for anyone who has ever been told to CLEAN UP THAT ROOM! Good middle school read. It is a little on the bizarre side with little people spawned on a dirty gym sock hidden under bed. Called Toddlians these little people help Todd defeat bullies and appreciate his real friends. Okay, so the sci-fi basis was more than a little thin. Who cares? This is a funny story about a geek who spawned life on his gym sock. It reminded me of The Plant That Ate Dirty Socks, which was one of my faves as a kid. Good for a fun afternoon laugh. Recommended. Boys. Will. Love. This. (this girl did too). It's full of totally gross humor- like seriously gross- and c'mon, the kid grows an entire civilization in the sweaty sock under his bed. How great is that? At it's heart though is a great story that will strike a chord with middle school kids. i received this copy from the author in a giveaway. is really different from what I usually read but it was a good book. Louise has a great imagination! Pretty gross. Good "guy" read for upper elementary and middle school. It was cute but could have been so much more. I would have liked to hear more about the little people and less about Todd. It's mostly about a kid who is bullied. Overall, kind of dull. Louise grew up on horseback in the Midwest. The only thing that could pull her out of the saddle was a great book or a game of Star Wars. The lone girl in her neighborhood, she always got to play Princess Leia, thus her mad lightsaber skills. (Yes, she had the cinnamon roll side-bun hair.) Louise even cleaned her room on occasion, but never found anything but a rogue hamster under her bed. Louise s Louise grew up on horseback in the Midwest. The only thing that could pull her out of the saddle was a great book or a game of Star Wars. The lone girl in her neighborhood, she always got to play Princess Leia, thus her mad lightsaber skills. (Yes, she had the cinnamon roll side-bun hair.) Louise even cleaned her room on occasion, but never found anything but a rogue hamster under her bed.